"During the reign of Anastasius, Bulgars started to conquer this land, they passed to Bъdyne [Vidin] and firstly begun to conquer the Lower land of Ohrid and later all of it." --Bulgarian translation of the Manasios Chronicle made during the reign of John-Alexander, 14th c.
According to early historical sources, Bulgars settled permanently in Srem and Singindunum (Belgrade) since the 5-6th century AD. Consequently, soon after that, Bulgars settled the territory of old Macedonia – dolna zemya ohridska [the Lower Land of Ohrid]. According to scripts left by the Turnovo kings, Bulgars settled Macedonia at the beginning of the 6th century, at the time of Emperor Anastasios. (from paun, 'peacock'), Toyaga (staff), Balsha, Kraguesht (from kraguy, 'hunter falcon'), Telesh (cf. the name of knyaz Telets), Telesh-Birnich, Hъrsesht, Zidone, Zidu, Sibin – from the Bulgar boyar name Sibin (renamed by the Romanians in Sibiu), Gubera, Almъzhiu, Segarcha, Mъndra (probably the same as the Mundraga fortress, in which Simeon took defence in the war with the Magyars), Tamburesht, Tsiguresh, Tsutsulesht, Tъtъran, Botorodzhi, Belchug, Tekuch-Kalinderu, Talpa-Trivalia, Okaba, Petrish, Kuzhmir, Bihar (Biharya), Hust, Bъlgrad (Gyulafehérvár), Beket, and others. Some of these names have their close counterparts further east. For example, the name Halъnga reminds the word Halanga or Halandzh characteristic of Volga Bulgars and Pamir, and the names of Bihar, Hust and Beket remind the Pamir cities Bukhara, Host, and Bakat - the last of which was mentioned as early as 550 AD. The name of the former town Pest (Peshta) – one of the towns that make today Budapest – is also of ancient Eastern origin which in Pamirian literally means 'the slope, the hill'. Most of those names were found until recently in Romanian and Hungarian maps, and some exist even today. Almost the whole territory of present-day Romania is studded with ancient and medieval Bulgar names. The reason for this is not difficult to explain, since the oldest Bulgarian chronicle – Nominalia of the Bulgar kanas (kniazes), composed around 765, points out that for more than five centuries Bulgars had a country beyond the Danube ("ob onu stranu Dunaia"). But these traces are found not only in Romania and Hungary. They are also preserved in the region that was the earliest Bulgar conquest on the south side of the Danube, located in today eastern Serbia. The first permanently controlled Bulgar land in the Balkans, recognized by Rome, is South-Danubian Panonia, with the major cities of Sirmium, Singindunum and Bononia [Angelov]. The arrival of Bulgars in this area was marked by a whole series of important changes. The city Sirmium got its new name Srem and the rivers Timakus and Margus were renamed in Timok and Morava. The river flowing to the west of Srem (today Serbianized as Mitrovica) got the name Kolubara. Old Singindunum became widely known as Alba Bulgarica ('Bulgarian town'). The Romano-Byzantine castle of Singindunum had white stone ramparts, and the Bulgars named it Belgrad, meaning 'White Castle' which contrastingly corresponds with the present-day Hungarian town Csongrád = cherni grad = 'black castle' [István Bóna]. Near Belgrade, a new fortress was built with the Bulgar name Tetel. All these changes occurred in the fifth-sixth century, when South-Danubian Pannonia was settled by the Bulgars. Even today most of the rivers flowing through eastern Serbia have the names given to them in that ancient Bulgar times. The changes that Bulgars made in the names of those rivers and towns have their own interesting history. Why, for example, the river, called Margus in Roman times was renamed by Bulgars to Morava? The reason is that in the eastern regions, from which Bulgars arrived, the word murava occurred which means 'a quiet, peaceful river'. Like many other peoples, Bulgars liked to name things in simple words that make sense to them. And that is why they translated in their language most foreign names that they found in the Balkans. They did so not only with the names of rivers, but with the names of towns. In the oldest Bulgar centers of the Balkans – the land between Vidin and Srem – many ancient town names sound even today. Kragujevac received its name from the famous Bulgar hunting falcons – kragui – raised by specially designated people – kraguyari. Even today in Eastern Caucasus in areas once inhabited by Bulgars, the word kraguy means 'falcon'. The village Kutugertsi near Timok received its name from the name of the former Bulgar healers called kutugeri. Later this name became one of the names of the Bulgarian Bogomils. Tumba peak in Timok region also has an old Bulgar name. In one of the inscriptions of Omurtag, the tall mound halfway between the Danube and Pliska was called with the same word Tumba, and today in the old Bulgar territories around Pamir, mounts bear the names Tube and Tyube. Ancient Bulgar language echoes from the names of many peaks and mountains in this region – Vrъshka Chuka, Kom, Svъrlig, Kъrlig, and Viskyar. Echo of these names sounds today also in the Pamir Mountains, where viskyar in some languages means 'a hill' and chuka means 'peak', and in the Bulgar lands in the Caucasus, where Svъrlig literally means 'Sparrow mountain' (from svъrlo, 'sparrow'). As a souvenir left by the ancient Bulgars in Srem and Belgrade regions, an old plaque was found with Bulgar symbols, on which the typical symbol of old Bulgars – IYI – was engraved twice. The village, near which this plaque was discovered also bears a very old name. It is called Shudikovo in honor of some already forgotten Bulgar named Shudik. A similar name – shudik – is found today in the Caucasus among the neighbours of the erstwhile Kubrat Bulgars. In addition to these ancient Bulgar names in the region between Vidin and Belgrade several other noteworthy names are found such as Murgash village, with the same name as peak Murgash in the Balkan Mountain, and also the villages Madara, Kalubre, Karanovchich, Chikatovo (from chigat, 'sword-bearer') Veli Shatra, Beleg, Chungula, Hubava, Globare, Globoder, Stopanya, Chokotar, Chuchulyaga, Vitosh, Mъrsach, Batush, Bubya, Gъrgure, Lagator, Kokoshine, Tsъrvulevo, Praskovche, Svirtsi, Vitoshevets, Plana, Prъzhdevo, etc. The ancient Bulgar origin of all these names is sealed in the words themselves. "So, passing through Mallevilla [Zemun] where the limits of the Hungarian Kingdom end, he went, without making an offence or enemy attack, as far as the Bulgarian town Belegrava [Belgrade]. ... Walter asked from the Bulgarian governor and the city governance a right to buy vital necessities. ... Walter abandoned his comrades everywhere and, running, passed the Bulgarian forest and retired in the very rich town called Nizh [Nish] in the middle of the Bulgarian Kingdom: there he found the duke and the governor of the land whom he told ... the above duke named Nikita, prince of Bulgaria and governor of Belegrava [Belgrade] ... " [Alberti Aquensis]. The last evidence of Belgrade as a Bulgarian town is from 1259 when it was conquered by the Magyars (PC, II, 76-77). 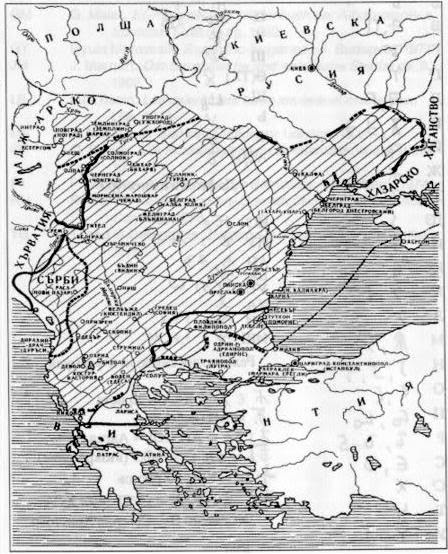 Two centuries later, when the Magyars were pushed by the Turks beyond the Danube, Belgrade fell in the hands of the Serbs, who at that time were vassals of the Ottoman Empire. In strict observance of their vassality, Serbs settled permanently in the conquered with Turkish help town and over time it became their main stronghold. This important episode in the life of ancient Bulgars can be traced across maps. From Pirot, going through Gostivar, a town named so by the Panonian Bulgars, one reaches the land of Ohrid – the Promised Land that was destined to be Bulgarian as early as the 6th century and where, according to the old Bulgarian chronicles, began the gradual settlement of Bulgarians on the Balkan Peninsula. The early settlement of Bulgars in Ohrid region is marked with the same traces as their settlement in Dacia Panonia to the north of the Danube and in Sirmium between Vidin and Srem. Coming near the Ohrid lake, the Bulgars immediately gave new names to towns. Former Lichnida got its present name Ohrid, the Lichnida Lake became Ohrid Lake, the river Axios was renamed to Vardar, the town of Pelagonia was called Bitola (from the old Bulgar term bitol – 'gathering place'), the town of Selasphor became Devol, new fortresses were built and were called Struga, Prespa and Prilep. All major towns in the region of Macedonia received new names by the Bulgar settlers and this fact is explicitly noted in the old Byzantine sources. The Byzantine poet John Tsetsas, ridiculing the ignorance of some of his contemporaries who were not aware that Vardar was the new Bulgar name of the River Axios, even wrote a satire on this occasion. But the Peonians (Panonians) are Bulgars! Do not believe fools who tell you that Peonians are different people. Those fools think that Axios is different from Vardar. [Sources, p. 104]. For Tsetsas, it was funny not to know that the Bulgars came at the shores of Ohrid Lake from Panonia, called Peonia by medieval Greek authors, and that these new settlers renamed Axios to Vardar. But how exactly the new names Ohrid and Vardar came into being and why the Bulgars were those who brought them in the Balkans? There are indications that in these names the ancient Bulgars put some special sense. In the Pamir and Hindukush, the ancient Bulgar native land, the word var means 'powerful'. And the rivers there most often bear the suffix Dar or Darya: Amu Darya, Sur Darya, Surhan Darya, etc. Therefore, the name Vardar was not only brought by the ancient Bulgars, but it was derived from their own language, and Tsetsas was not only once but twice correct when he scorned those who were not aware of its Bulgar origin. The meaning that the old Bulgars put in this name is quite deep. In their language Vardar meant 'Powerful River, Heroic River'. Bulgars put a similar fine meaning to the name of the main town of south-western Macedonia – Ohrid. It is most likely associated with the word okhro (gold) that is found to the present day in the area of the old Kubrat Bulgaria. Traces of this old Bulgar word are kept in the term okhra (yellowish paint) preserved in the modern Bulgarian language. Ohrid probably means 'golden' or 'gold-like'. Evidently, this name did not arise accidentally. It bears quite a strong resemblance to the ancient Greek name Lichnidos, which means 'shiny', 'brilliant'. Thus Ohrid, like Vardar, turned out to be an old Bulgar, quite beautiful, name: 'Golden Town'. Other major towns of Ohrid region also carry ancient Bulgar names. The names Struga, Prespa, Prilep are understood only by someone who knows Bulgarian. The word struga exists till the present day in some Bulgarian dialects to mean 'mountain pass' or 'a narrow corridor to let sheep in the pen' (also called sturga), while prilep (bat) and pryaspa (snowdrift) are words widely used in modern Standard Bulgarian that do not exist in any other Slavic language. The name Devol, incomprehensible today, with which Bulgars renamed the town Selasphor also has a very interesting origin. Similar names of settlements are found only in the region of the Pamir, where devol means everywhere 'high fence'. In the speech of people from the regions of Ohrid, Prilep, Bitola, southwest Korcha and other Balkan lands we find remnants of the language spoken by the Kuber Bulgars. There is a number of hitherto unexplained words and phrases such as apotinano (and you, mommy) zhimiboga (my god), tugina (abroad), vo gerizon (in the brook), kuchento (the dog), kъshta (house), toynaka, tyanaka, az, mie (that), eve, evo, gyoa (it seems that), kod (with, at), etc. which are found even today in the Orient in the lands, sometime populated with Pamir and Caucasian Bulgars. The traces left behind by the ancient Bulgars on the map of the low Ohrid land once correctly known as Lower Bulgaria are unusually numerous and extend down to the coast of the Adriatic Sea. On the territory of present Albania the strongholds Kanina, Korcha, Himar, Balshi are now known from very old chronicles. These names have unmistakably old Bulgar origin. One of them, Himar, is similar to the name of the capital of Kubrat Bulgaria, Humar, while the town of Korcha sounds very similar to another large town of Kubrat Bulgaria – Korchev (today Kerch on the Azov Sea). The early presence of Bulgars in these parts is shown by the year 866 inscription found near Balshi which reports the Christianisation of the Bulgars by knyaz Boris. The very name Balshi is found not only in Albania but also in two other places – beyond the Danube, in the present-day village Balshi and near Sofia, where exists a village called Balsha. Interestingly, during the 9th century some westernmost Bulgarian towns had two names – old Bulgar and Slavic name. For example, Balshi was called also Glavinitsa and Dubrovnik (then a town bordering Bulgaria) was called Raguza. The custom of Bulgars to give their own names to every larger town is evident throughout the regions settled by them. Bulgars named in their language even the capitals of foreign countries. Vienna, for example, was called Bech or Pecs, and Austria was called Bechko. Due to the fact that many old names of towns existed in two or even three forms, it becomes possible to understand their hidden meaning. For example, if one look at the lands of the Orient and in particular in the Pamir and Caucasus, it appears that there the word balsha means literally 'pillow', that is, the same meaning as the old Slavic word glavinitsa. Again in the Pamir one finds the word Pecs, which literally means 'curved, kinked', i.e. the same meaning as the old Slavic word viena ('bent, twisted' from the verb viya 'twist, bend'). Bulgar and Slavic names are often close matches to each other, and the Bulgar and Greek names were sometimes similar in meaning, as evidenced by the names Lichnida and Ohrid. It is difficult to describe all traces that ancient Bulgars left in near Ohrid and in Albania. Here will be listed only the most important and interesting examples. In South Macedonia we find the settlements Trapshi, Kolshi, Gobeshi, Belshi, Gramshi formed in the same model as the old Bulgar name Glavinitsa – Balshi. The suffix -shi that is characteristic for these names is included in old Bulgar words humshi and tulshi from the Preslav inscription and represents a special old Bulgar nominal suffix. Of old Bulgar origin in that region are the names Chuka, Chuka-borya, Tabahon, Kulumria, Okshtuni (cf. the name Ohsunos), Zhupani, Harusha, Harushasъ, Bulgarets, Turan, Tumba, Tuholyo (cf. OBg, tohol in Avi-tohol), Kutsaka, Shishman, Botun, Sharenik, Kruma, Kosara, Lъoyma, Sukadzhiu (cf. OBg. sokachii, 'chef'), Plana, Munega, Dzibraka and others. In Central and Eastern Macedonia and Greek Thrace we find Sindel, Isperlik, Zuzula, Tsare (cerris oak), Vinyahi (cf. with knyaz Vineh), peak Presian (above Kavala) peak Chavka (daw), Kishino, Shamak (name of swamp), Kanareto (village in Northern Greece), Mount Harvata and others. In Albania are preserved names as Kamchishta, Sharan (carp), Sharani (carps), Mostachi, Zhegulya (joke pin), Bilecha, Tsera, Plana, Shevarlie, Tolishe, Mъrtsine, Chukasi (rocky peaks) Gruemira-chesme (fountain of Gruemir) Bukъmira, Bъhot, Brestus (the elm), Tana-i-bulgaritъ (Tana the Bulgarian) Mъniku (midget), Kuchi, Sasani, Kutse, Tsuta-Zhupanatъ, Stani-i-Mizъs (Stan the Moesian), Mushan, Priska, Balsheni, Bardor (cf. OBg Barduar), Veli-Kaliman, Borichi, Bushnish (hemlock), Rabosha, etc. Drach on the Adriatic, identified as a Bulgarian town in the 7th century, also keeps its name. The arrival of Bulgars in Dobrudzha and the Danubian Plain was marked by a series of great changes that were similar to those in the Ohrid region. Two of the largest extant fortresses, Durostorum and Odesos, were renamed by the Bulgars to Drъstъr and Varna. The ancient Dionisopolis (today Balchik), called Kruni by the Thracians, received its new name Karvuna while the subsequently acquired town Beroe was renamed to Boruy. New towns and fortresses, unknown until then, appeared such as the Madara fortress, Tutrakan (close to the former Transmariska), Kebedzhe (near the former Dianopolis – Devnya), Shumen, Shabla, Sindel, Nevsha, Hъrsovo, Cherven, and south of the Balkan – Krъn, Tuthon (former Anhialo) and Chenge, called Tsika by the Greeks. Some of the towns in Eastern Bulgaria had three names in this period – Bulgar, Slavic, and Greek – e.g. Tuthon–Pomorie–Anhialo (cf. Kefalonia–Glavinitsa–Balshi). Even the newly named capital Pliska seems to have had two names at first – Plъskov and Aboba. The closest village to the ruins of Pliska was called Aboba by the local population. It is remarkable for the Eastern Bulgarian lands that almost all bigger towns in this period get their names from the Asparuh Bulgars. Their names most often come from the east and have very clear and transparent meaning. In the ancient fatherland of Asparuch Bulgars even today can be found the word drъstъr meaning 'strong, difficult to capture'. Also occuring are the words boruy which means simply 'town', the word tutra – 'steepness' which probably the name of Tutrakan comes from, and also the word aboba – 'big earthen wall' which probably one of the names of Pliska (Aboba) comes from. The name of the main Bulgar temple of Madara was also brought from the east. Traces of it are found both in Caucasus where the center of the former Kubrat state was located, and close to Pamir. In Caucasus the word madar means even today 'keep, revere' [Chuvash]. In the ancient languages that were spoken near the western borders of Pamir – in Mohenjo-Daro and Harapa, the sacrifications were called mandira, and the priests were called mandira-karan. The Sanskrit term mantra – 'sacred hymn', is also connected to these ancient religious terms. Madara was no doubt the sacred home of Bulgars. This characteristic is sealed in its very name which in ancient Bulgar meant 'the sacred place' or, maybe, 'the blessed place'. In the same way as in later times many settlements were founded with the names Tsъrkva, Manastir, Manastirishte, Bulgars gave the name Madara – 'the temple', 'the sacred place'. And namely because Madara was the most revered place by the Bulgars, in its rocks was cut the pantheon of the founder of the Bulgarian state – knyaz Asparuh. As a whole, traces left by the Asparuh Bulgars on the map of Eastern Bulgaria are as numerous and distinct as the traces left in the Ohrid region and in Albania. In both places, Bulgars named with their own names all major towns upon arrival. In the Ohrid region these are Ohrid, Bitolya, Struga, Prespa, Prilep, Kukush, Kostur, etc. ; in Albania: Drach, Balshi, Devol, Kanina, Korcha, Himar; and in Eastern Bulgaria: Drъstъr, Varna, Karvuna, Madara, Tutrakan, Shumen, Shabla, Kaspichan, Sindel, Chenge, Chirpan, and the newly built capital – Aboba. The handwriting of state construction in Bulgars was the same. So were the names they gave to their towns. They are usually beautiful eastern epithets that are found even today in the lands inhabited by ancient Bulgars before their migration to the Caucasus and the Balkans. All lands that today surround Bulgaria are colored with the evokative and beautiful names brought long ago by the ancient Bulgars. Such names are found in Romania and Hungary (Biharya, Peshta, Pech), in Eastern Serbia (Srem, Kraguevac, Morava, Pirot, Nish), in whole Macedonia and Albania. These names delineate the living space of Bulgars. They all are branches of the big nest built by them after conquering the Balkans. But not only towns in the surrounding lands bear Bulgar names. Such names bear most mountains to the west and south. Ancient Bulgar sounding is preserved in two of the most common mountain terms in the Balkans – chuka and chukar. These two words occur in Romania, and also in Eastern Serbia – the first Bulgar beach-head on the Balkans, and also in the Ohrid-Skopie region, Albania, and Northern Greece. In addition to the Balkans, the specific term chuka occurs in only one other region – in Pamir and Hindukush. There, the word chuka is pronounced in the same way as in Bulgaria and means a high, most often bleak, mountain. The two places in the world where this geographic term occurs have only one thing in common: there lived or live Bulgars. Therefore, this word is undoubtedly a heritage left by the Bulgar forefathers. That Bulgars is the people that brought to the Balkans the word chuka is evident from the derivative term – chukari. It is connected to the word chuka approximately in the same way as the old Bulgar title boila was connected to its derivative word boilar (bolyars). In both word pairs, the specific suffix -ar is found with which in the Bulgar language the plural of nouns was formed. So there can be no doubt that these names are of Bulgar origin. Names as Chukich in Western Romania, Chukaritsa in Eastern Serbia, Chuka and Chuka-Borya in Macedonia, Chukata and Chukara in the Rhodopes, Chukas and Chukasi in Albania today point like huge road signs the scope of the many-century Bulgar presence on the Balkans. And names as Vrъshka chuka, in which one of the words is Slavic, and the other is Bulgar, show that the word chuka was transferred from Bulgars to their neighbouring Slavic people. It is obvious that this combined name arose in a very early period, witnessed by the archaic epithet vrъshka, which, albeit Slavic, is not found today in any living Slavic language. Of ancient Bulgar origin are also other three specific mountain terms – rъt, rid, and urva. All three are found in the east among the peoples of the Pamir circle. Some of the not so common and isolated names of peaks and ridges like Burel, Viskyar, Ruy, Ruen, Midzhur, Syutkya, Bunay, or of fields and gardens like Zne-pole, Mosko-pole, Bohot also come from the east, from the old homeland of the Asparuh Bulgars. The name Burel comes probably from bur – 'chalk', a widely occuring word in Pamir. Midzhur comes from midzh – 'black', a common word among peoples that populate the lands of the ancient Caucasian Bulgars at the Caspian Gates. Zne-pole comes from the Pamir word zne – 'closed, secretive', Bohot from boh – 'garden', and Syutkya in the Rhodopes from sutk – 'rounded' [Pakhalina]. From very far away come the names of some rivers, swamps, and lakes on the Balkans. Other than Morava, Sava, and Vardar, that were mentioned above, their own eastern counterparts have also the rivers Vъcha, Skъt, Kamchia, Bъta, and Tsibъr while the names Mikre and Shamag (a swamp near Skopie) remind the Caucasus word mikre (swamp) and the old Bulgar name of the Balaton Lake – Shomog. Contrary to the assumptions that old Bulgars disappeared leaving almost no traces, they spangled the map of the Balkans with tens and hundreds of their own names. Their memory is written on the land itself. And from this indelible and indestructible land memory, it can be best surmised where the old Bulgars lived, what was their occupation, what was their language. Of special scientific value are the oldest Bulgar names remaining on the territory of today Romania, Hungary, and Serbia, as well as Macedonia and Albania. If we look closer in such ancient names as Biharya, Zidu, Turnu, Stopanya, Kalubre (Kalubrya), Madare (Madarya), Bitolya, Tsera, Linya, Zhegulya (joke pin), Rabosha, Mъniku (the midget), etc., scattered around in the lands neighbouring Bulgaria, we'll see a recurring feature. They very often end with the definite articles -a, -ya, -u (-o) that are characteristic in the Balkans only for Bulgarian language. By this trait, old Bulgar names can be easily recognised among the names of any neighbouring Balkan people. Because only ancient Bulgars had words like Biharya (the bihar, i. e. 'the monastery'), zidu (zido, 'the brickwall'), or Turnu (turno, 'the tower'), Kalubrya (the kolobъr), Stopanya, Chigota (the chigot), Pirgu (pirgo, 'the fortress'), Babuna (the Bogomil), Leskota ('the hazel'), etc. It is well known that sometime only in Bulgarian one could say zidon ('the brickwall'), or chukava ('the hill') and this trait survived till present time in the folk dialects where at the end of words various definitive suffices are attached – cf, e.g. the variants zhenava, zhenana, zhenasa which in several Bulgarian dialects have only one meaning: 'the woman'. In the ancient Bulgar names scattered widely in the neighbouring countries one can see attached at the end almost all of these archaic definite articles. Side by side one can find zidu and zidone, as well as Turda and Turtava ('the mine'), Orsha (patrol, patrol booth) and Orshava (the patrol). This feature occurs as early as 6th, 7th, and 8th centuries in the trans-Danubian Bulgar names like Biharya, Orshova, Turnu-Severin, Turnu-Mъgurele, Turda (Turtava). It can be seen in the same early period in the Sirmium region and the Ohrid region. When Bulgars settled in these regions in the sixth century there appeared names such as Madarya, Kolubrya, and Bitolya. Such typical Bulgar names appear very early also in the north-eastern part of the Balkan Peninsula. Soon after the arrival of Asparuh, the eastern part of the Balkan Mountain acquired the Bulgar name Veregava (ModBg:verigata, 'the chain'), which is mentioned around 830 in the Theophanes chronicle. The suffix -va in this new name is the same as in the old trans-Danubian names Turtava and Orshova, composed from the words turta (turda) and orsha. To the east – in Pamir and Hindukush, female nouns acquire this very same definite article -va in a number of languages. The name Madara, no doubt brought by the Asparuh Bulgars and preserved in Eastern Serbia as Madarya, shows that in the language of Asparuh the definite article -a (-ya) occured, i.e, the same definite article that appears in the trans-Danubian names Biharya and Peshta and in the Timok name Kolubrya. Asparuh Bulgars brought to Eastern Bulgaria also other names of this type. The names of Madara, Bitola (Bitolya), Veregava, Kolubrya and others show that in the language of Asparukh Bulgars each word had two forms - defined and undefined, something missing in Slavic languages. The definite form was constructed with almost the same articles as in modern Bulgarian. The article for masculine was -a, and for feminine most often -va and was added to the end of the defined word. That feature of Bulgar names is found in many other strange toponyms. For example, when John of Rila decided to become a hermit, he went first in an area that bore the name Skrino, i.e. ModBg:skrinъt ('the dresser', [Reader, p. 463]). This was around 920, but the name of the area itself was undoubtedly given earlier – in the 8th or 9th century. Around 920, the large port Konopa ('the hemp') was mentioned to be in Bulgaria in today's Northern Dobrudja [Reader, p. 166]. It was one of the two most important ports between the mouth of the Danube and Varna and was located north of Constantia (Kyustendzha). The name Konopa containing the defininitive article -a was clearly given by the Bulgars long before 920, because at that time Konopa was already a big and famous city. Also in the ancient name of Pliska – Plәskova, is apparent a particular definite article. Its closest concept is the Iranian word Plәsko – "center, environment", but at its end is attached the already known definite article -va (as in the words Veregava, Turtava, Orshova etc.). The name of Pliska – Plәskova, which in Bulgar language meant most likely 'the center, the capital', was formed by the same grammatical pattern as Madara – with a postfixed definite article. Names of a similar type appeared very early in all other parts of the old Bulgaria. For example, when in 1017 Basil II defeated Samuil's Bulgaria, its last defender Ivats retired to an inaccessible mountainous place whose name the Greeks wrote as Vrohot [Reader, p. 273]. In Western Bulgaria the word vrәh ('peak') sounds in many places like vrao, vraot, vrahot, and this shows pretty well what the word marked as vrohot could mean. Before us is a typical Bulgarian name ending with a full definite article (a variant of -әt) used as early as 10 centuries ago. At that time, written Bulgarian used exclusively the Slavic case system. Definite articles started to appear in writing 250 years later. The same suffix -ot occurs in the name Botrot (from botra – 'dairy') recorded again in Samuil's Bulgaria. Still in this early age – around 1070, in the Eastern Rhodopes near Bachkovo Monastery, names are found written as Velikon (i.e. 'the great') and Lahanara i.e. 'the gardener' (from the Greek word lahana – 'cabbage, vegetable'). The first contains the definite article -on, similar to that in the name Zidone, and the second – the well known definite article -a. Charters of various churches and monasteries from Thessaloniki and Ohrid were found in the same period that list male names and nicknames Buhala (i.e. 'the Owl'), Bardokvata, Bodina, Bryasta; all show that the peculiar Bulgar article forms were used very early, and did not arise in 13-14th century, as was until recently assumed. With their arrival to the south of Danube ancient Bulgars brought the postfixed article as the most important trait of their language and this is why the names containing postfixed articles occur in 7-10th century in all Bulgar lands – in North and trans-Danubian Bulgaria, in West Bulgaria and Lower Bulgaria (Ohrid Region), in Eastern Rhodopes. It is notable that all early names that end in Bulgar article forms have roots that are foreign to Slavic languages. The words verega, galat, plъsko, orsha, turda, konop, bihar, madar, kolobъr, butra from which the names Veregava, Plъskova, Orshova, Turtava, Konopa, Biharya, Madara, Kolubrya, Butrot are constructed, do not occur among Slavs while they are very common in Bulgar-inhabited lands before the Bulgar migration to the Balkans. This is a proof that the postfixed article forms in Bulgarian language did not arise on a Slavic basis but are inherited from the language of Asparuh and Kuber Bulgars. Indeed, looking through the old Bulgar names of towns and mountains, one cannot help noticing that they contain many specific words by which the Bulgarian language differs from the surrounding Balkan languages. To get a better impression about this, let us select from the old Bulgar names dispersed throughout Romania, Serbia, and Macedonia, only those that even today are understood by each Bulgarian. Zidu, Skrino, Konopa, Stopanya, Globarya, Brъshlyanya, Hubava, Morunesht, Birnich, (Telesh-Birnich), Chungula, Tsiguresht, Tamburesht, Toyaga, Bisercha, Belchug, Gizdъvesh, Murgash, Chukara, Chuchulyaga, Gushtera, Machkata, Sharani, Hralupi, Gъrlitsa, Gurgul, Gъrgur, Gurgulyat, Buhala, Kurilya, Kraguevets, Tъnganu, Gliganu, Kuchi, Mъniku, Pryaspa, Prilep, Gubera, Gъvana, Vъrtopu, Devesel (ModBg: devesil, 'lovage, hogweed'), Bъzъn ('the elder'), Tъntava (ModBg: tintyava, 'gentian'), Chubra, Buren, Praskovche, Kachulats, Kokoshine, Kosheren, Kochine, Tъrlo, Shipot, Balvan, Chukich, Rabosha, Tsъrvulovo, Svirtsi, Obay gora, Bayna basha, etc. All these names are written in the way they are found in Romania, Serbia, and Macedonia, i.e. with the inavoidable distortions under Romanian and Serbian influence. But even so, they remain markedly Bulgarian and cannot be confused with Serbian and Romanian names. These words are Bulgarian, and not Serbian or Romanian, their grammar is typically Bulgarian and this is why every Bulgarian can understand them without translation while Romanians and Serbs cannot. But why a Bulgarian can understand these names while for other peoples, including Slavic ones, they are vague and obscure? There are two reasons: first, because Slavs haven't most of the peculiar words contained in these ancient names. Second, because other Slavs haven't the specific article forms that help translate their exact meaning. The only people that had such words and such grammatical forms in the Balkans were the Asparuh Bulgars. Therefore, all the above-listed names are left by them. They are a direct heritage from the Bulgar language. Not only Bulgarian history but also the map of Bulgaria is to a great extent created and written by the Asparuh Bulgars. But this fact was unknown for a long time. Only discovering the ancient names, dispersed by Bulgars everywhere on the Balkans, helped to understand what a people they were and what they left on both sides of the Danube. Today there is no doubt that a large part of the names that sound not only under the today's Bulgarian sky but also in the neighbouring Balkan countries, are brought by the Asparuh and Kuber Bulgars. Serbs use Bulgar words when they pronounce the names of Srem, Kraguevac, Nish, Pirot, and Morava. Romanians wake a sound of the thousand-year old Bulgar language when they pronounce the names of Biharya, Orshova, Turnu-Severin, Turnu-Mъgurele, and Bъalesht. And Bulgarians pronounce Bulgar words when they mention Pliska, Madara, Tutrakan, Shabla, Kavarna and many other Bulgarian towns, and also when they mention Ohrid, Vardar, Drach, Balshi, Korcha, and Raguza. The fate of every great people seems to be giving something to the neighbouring peoples and then sink into itself, giving away part of its own creations and sometimes even forgetting about them. But even when a people leaves the places that it once inhabited, it leaves behind names of towns, rivers, and mountains. And by these names, every people can see who it was and where it lived. Die Slavische Manasses-Chronik. Auch der Ausgabe von Jan Bogdan. Muenchen, Wilhelm Fink Verlag 1966, page 115. Durham, M. E. (Mary Edith), Twenty years of the Balkan tangle, BiblioBazaar, LLC, 2007, ISBN 1434634264, Project Gutenberg e-text # 19669, p. 40. Alberti Aquensis. Recueil des Historiens des Croisades, publié par les soins de l'Académie des inscriptions et belles lettres, Historiens Occidentaux, IV, Paris 1879, pp. 269-713. Hi there! I was just curious about the "Cymric" language of Pamir you mention - there is no such language listed among the Pamir languages and the only match one can find over the internet is "Cymru"="Welsh". Where did you take you info from? which puts Cymrians in the base of the Scythian formation. The Eastern Scythians (Tochars) lived in the Pamir region. - first minor - it appears that the right English term is "cimmerians"
- second serious one - the Cimmerians never lived in Pamir,but at the North-Eastern/Easten edge of the Black sea (thousands of kilometers away from Pamir). Additionally, nothing is know of their long extinct language, apart from only a couple of personal names of their kings recorded in Assyrian texts. So, I would conclude that if the reference from Artamonov says something about their "Pamir" language you should take it with a really large grain of salt. Oh, I forgot another point - the "Galata" etymology sounds also a bit overblown - there is a large number of "Galata" in Turkish place names (deriving from the Eastern Gauls of Anatolia), and to me the Turks seem to be a more likely source of such place names in Bulgaria, given the large impact they left on Bulgaria (topography, lexicon, cuisine). I agree with all your points. I'll look into the text and correct it accordingly. keep it smart. I cant wait to read much more from you. This is really a great site. I hope you don't mind some minor corrections. zid = brickwall and turn = tower are usual romanian words. The Romanian suffixes for the definite article are -u[l] for masculine and -a for feminine. In formal speech, in literary language, it is -ul, but in informal spoken language, we usually don't pronounce the L, only the U. So Zidu and Turnu (btw, it is Turnu MagurelE) are normal Romanian words. There are other place or river names that have not meaning in Romanian, but those two do have. Banat comes from ban = governor of a border province. Afaik the word exists in Hungarian, Serbian and Romanian - I don't know which of them borrrowed from the other. Thank you for reading the post thoroughly and looking into details. Your suggestions make sense, so I will consider making some changes in the text. Interpretation of Banat as coming from ban (mountain) or ban (governor) is moot. My opinion is that ban (governor) as you suggest is more likely having in mind the designation of territories as khaganate, protectorate, etc. Probably it has been Banate, Bannate (a teritory belonging to the ban). Turnu Magurele is probably also Romanian because the Old Bulgar word for fortress (tower) is pirg. Magura is a known Aromanian (Vlah) word for hill (BTW we have the famous Magura Cave near Belogradchik, a region with considerable Vlah population in the past). So Turnu Magurele probably means 'a tower on the hill' in Aromanian. I do not agree about zid. It is a typical Bulgar word, and if it exists in modern Romanian, it is a loaned word from times past. In the original Bulgar form it is with the typically Bulgar dz sound: dzid. Some Bulgarian dialects still preserve the sound dz, so it is dzid there, but most dialects replace dz with z. In modern Bulgarian this word has the typical doublet Slavic / Bulgar form: stena / zid. More frequently used is the Slavic stena (wall) and zid has been restricted for a stone wall (in the past stone walls were more common). But I did'n deny that zid is a word of Bulgarian origin. I only wanted to say that in a milenium or so after the borrowing, it became a usual Romanian word. About "magura", it means hill not only in Aromanian but in Romanian too, but it is seldom used nowadays in Romania - mostly in (many) toponyms and in some folk songs of the shepherds. The usual Romanian word for hill is "deal" - of Slavic origin, I supose. "Magurele" would mean "little hills" in Romanian. About "Alba Bulgarica" (Belgrad), there is a town Alba Iulia in Romania, one of the oldest in Transylvania, It was first called Alba Iulia (White Iulia) in latin, in Hungarian Kingdom's papers, and Gyulafehervar (White City of Gyula) in Hungarian, but, centuries ago, Romanians called it also "Balgrad". "Alba" means white in Romanian, as in Latin, and "Balgrad" means nothing in Romanian. There is also a town that was in Romania before the war and was called Cetatea Alba (White Citadel) and in USSR after the war (now it is in Ukraina) and Wikipedia says that in Russian, on USSR maps, it was called Belgorod-Dnestrovskiy. Mr. Antonov: I have two questions: 1) You mention Behot in Albania. Where is it? I can't find it on the map. 2) You mention "the Bulgar boyar name Sibin". Do you mean that his personal name was Sibin (like Boris)? Or, do you mean that his title was boyar-sibin or sibin-boyar (like 'bori-tarkhan')? 1) I suppose that you mean my mentioning of Bəhot (ə is schwa and is pronounced similarly to the Bulgaian ъ). Now this is a village 4-5 km north of the town of Peshkopi and its modern name is Bahutë. Thank you. My main interest is the name Barca, because of Kosice-Barca in eastern Slovakia. I am sure this area was part of the First Bulgarian Empire, and that Barca (Bartsa) is a clear indication of it. There was also a Vartsa in the vicinity of Grevena, in west-central Greek Macedonia (Vartsa is now Valta). I am sure this had the same Bulgar origin as the Barca in Slovakia. I have found numerous unusual (non-Slovak) toponyms in eastern Slovakia that are the same or almost the same as ones in northern Greece, and they all go back to the First Bulgarian Empire (in my careful opinion). I couldn't find a toponym in the Balkan Peninsula with the exact name Barca (pronounced Bartsa). The closest I could find is Bratsigovo, a town in the foothills of the Rhodopes in Bulgaria. Reading on the origin of this name, however, it doesn't seem well connected to Barca (Bratsigovo is supposed to come from 2 brothers - in Bulgarian "brat", therefrom Bratovo - Bratsigovo). Barca most probably comes from "bars", the Bulgar name of the Snow Leopard (Uncia uncia or Panthera uncia). The Bars is native to the mountains of Central and South Asia - Karakorum, Tian Shan, Altai, Pamir, i.e. the old abode of Bulgars. It was regarded as sacred animal by Bulgars. It is certain that the personal Bulgar name Boris comes from bars. Another name that is supposed to come from bars is that of Duke Laborc (pronounced Laborts), who in the Early Middle Ages ruled the region of Zemplín, now in eastern Slovakia. The Hungarian linguist J. Melich (1929) wrote that the name Laborc is from Bulgar origin "alp-bars" = hero panther (Melich) or "alp-bars" = East Asian Lion (Prof. P. Koledarov, 1979). However, T. Balkanski and M. Parzulova think that Laborc comes from "ala bars" = mottled bars in Bulgar language. Furthermore, the latter authors write "... on the same territory [Trans-Carpathia] are registered other anthroponyms from bars such as Barca, Barsa, Bъrsa, also Modern Romanian Bîrseu (Ţara Bîrseu) as a name of the Hungarian and Romanian populated South-East Transylvanian region Braşov (Vlâduţiu, 1962) as well as the Modern Hungarian forms Borza, Borzsa, Borsi-Kalman ..."
I noticed that there is a Barca (pronounced Barka) in southwestern Romania, along the Danube and east of Vidin. I suspect that it is another variation of Bartza. 1) Vasmer (1941) says that the place Tsegani (now Aghios Athanassios) in the Pella area of Greek Macedonia originated in the Bulgar term 'chegan.' But he does not say what chegan means, and I cannot find it in my Bulgarian dictionary. Is the word related to 'chigot' (swordbearer)? 2) In the name Balsha/Balshi, what does Bal- or Balsh- signifiy? 3) You mention a peak named Presian by Kavala. What is its name today? 4) Have you ever found a Bulgar (or Bulgar-Turkic) name like Sharosha, Sharisha, Sharsha, or Sharshi? 1) I do not agree with Vasmer in that the place name Tsegani originates from "chegan". Chegan comes from the Mongolian (Turkic) word "chagan" which means "white". Chegan / chagan is not a Bulgar word. In Bulgar, "white" is "balkh" which is Indo-European word and forms the root of the modern Bulgarian / Slavic word "byal". While it is true that Greeks cannot pronounce the sound ch /tʃ/ as they do not have it in Greek language, and replace it with ts, it is also true that the Greek vowel η (eta) can be read as either /e/ or /ɪ/. So Tsegani may well be Tsigani which in many modern European languages (including Greek and Bulgarian) means "Gypsies". 2) Balsha means "pillow" in Bulgar language. Some linguists (Beshevliev, Duridanov) hypothesize that the root of this word comes from balkh (white) referring to the white down (soft white goose or duck fluff / feathers with which pillows were filled). 3) Today peak Presian is called Pangeo (Ραγγαίο), 20 km west of Kavala. 4) There are many toponyms in Bulgaria and Balkans with the root shar / sharka which means "paint" in Bulgar and has been passed on in modern Bulgarian. We have also the adjective "sharen" meaning "colourful" and the verb "sharya" meaning "paint with colour". Examples of such toponyms are the Shar Mountain between Macedonia, Albania, and Montenegro, and many toponyms like Sharkovo in Bulgaria (several villages, a lake, and a peak). My main investigation is the similarity of toponyms/hydronyms in eastern Slovakia/northeastern Hungary and in Greece. It seems to me that the similarities are mostly because of the Bulgaro-Slavs in the 8th-9th centuries. 1) Chegan -- I have found this term mentioned as being from further east (such as Mongolia), but I thought that perhaps the ancient Bulgars (Turkic Bulgars) had picked it up and used it in some way, perhaps as a title/honorific. Besides Tsegani in Greece, I find the place-name Cigand in northeast Hungary. In both cases the name was used several centuries before the Roma (tziganes) appeared in eastern Europe. That is why I think there is some other explanation for Tsegani and Cigand, and I think it is because of the Bulgaro-Slavs and the First Bulgarian Empire. Bulgarian Wikipedia and did not find the name Presian mentioned. 4) Yes, I am familiar with the name Shar Planina. My main interest is in trying to explain the name of the former Sharosh County of northeastern Hungary (called Sharish in Slovak). It seems very possible that the name might come from a Turkic term, chariche (tsar), because of the Bulgaro-Slavs, who probably had kept that title/honorific. Vasmer is interesting in that regard in several of the toponyms he found in Greece. 1) In the name Balsha/Balshi, what does the Bal- or Bals- or Balsh- mean? 2) Vasmer (1941) says that the place-name Tsegani (now Aghios Athanassios) in the Pella area of Greek Macedonia comes from Bulgar 'chegan.' But he does not say what 'chegan' means. Does it come from 'chigat'/'chigot'? 3) You mention a peak 'Presian' by Kavalla in Greece. What is its name today? Or, by which village(s) is it located? 4) Do you know if there was an Old Bulgar place-name like Sharosha, Sharisha, Sharsha, or Sharisha? 1) The toponym Balsha (Balsa) is found in northeastern Hungary. The following toponyms have existed in eastern Slovakia: Belsha, Boksha, Dobsha, Domasha, Kalsha, Kalusha/Kaluzha, Kolbasha, Koksha, Shemsha. Because the First Bulgarian Empire was in the region in the 9th century, I believe there is a strong possibility that these toponyms are from that era. They seem to reflect what you wrote about the post-positive article in Bulgarian. Do you have any opinion/idea about these names? Any thoughts you have will be appreciated. 1) Do you think the name Baranya in Hungary and Vojvodina is of Bulgar origin? If so, what is the meaning? 2) In Bihar County, Hungary, there is a place called Bagamer. Do you think bag- derives from Bulgaro-Turkic 'bagain'? For Bagamer I am not sure. Its old name is Bagomer. Baranya and Vojvodina are Slavic, not Bulgar. Baranya comes from 'baran' - ram, male sheep. In Bulgar / Bulgarian it is 'oven'. Vojvodina comes from 'vojvoda' which consists of 2 words: 'vojna' - war, and 'voda' - leader, i.e. leader in war. It states that in Aegean Macedonia there was a village with the name Arbur, about 40 km. north of Thessaloniki. Arbur is now known as Koronouda. Is Arbur a Bulgaro-Turkic name? A Bulgaro-Slavic name? Perhaps it was originally Arburya? Any ideas about it will be appreciated. Haven't heard or seen such a village name. It doesn't sound Bulgar / Bulgarian, seems more like a Latin word. 'Arbor' is a Latin root connected with tree or wood, therefrom "arboreum". It is known that all through the Middle Ages there were pockets and whole villages in Bulgaria / Macedonia populated with Walachians (Aromanians, Megleno-Romanians). Maybe this village has been Walachian. 1. Thanks. I am sure that a Latin root is a strong possibility, especially for anything concerning trees. I recently noticed that V. Zlatarski (1934, Vol. II, p. 245) mentioned a place called Arban in the Kruje area just north of Tirana. Of course this likely has the same root, since it, too, was within the First Bulgarian Empire. There is Bihar even in India. This is not coming as a surprise because the origins of this name "BIHAR/BIHOR" comes from the Proto-Pelasgians and is tied to the Indo-European migrations. Bihar is a big town in India. There are scores of toponyms in South Asia which are almost the same as in Bulgaria. For example, Madara (India), Pliska (Pakistan), Shumen (Iran), Varna (Iran).